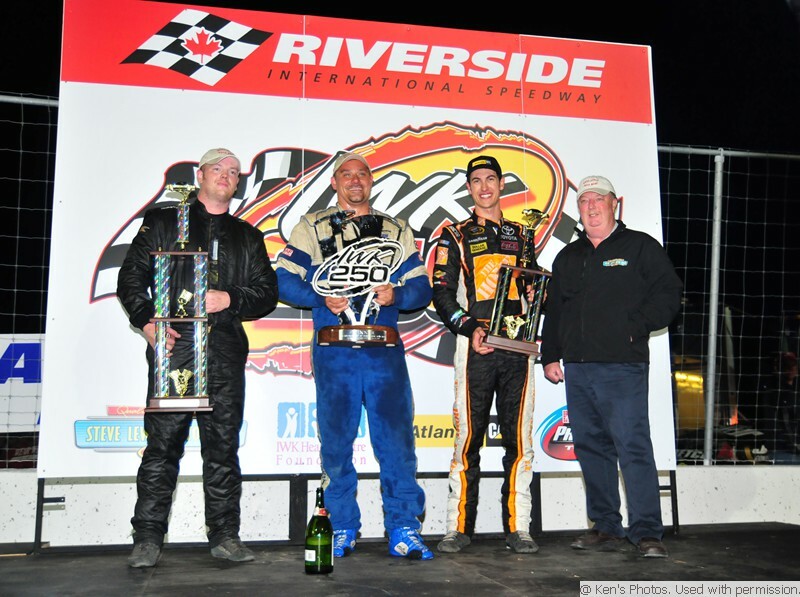 JAMES RIVER, NS (July 21, 2012) – John Flemming got the biggest win of his racing career Saturday night at Riverside International Speedway when he visited Victory Cirlce after winning the 2012 edition of IWK 250 Presented by Steve Lewis Auto Body. Flemming, an 18-year pro stock veteran and three-time Parts for Trucks Pro Stock Tour champion, has been chasing the IWK 250 title for all of his career. 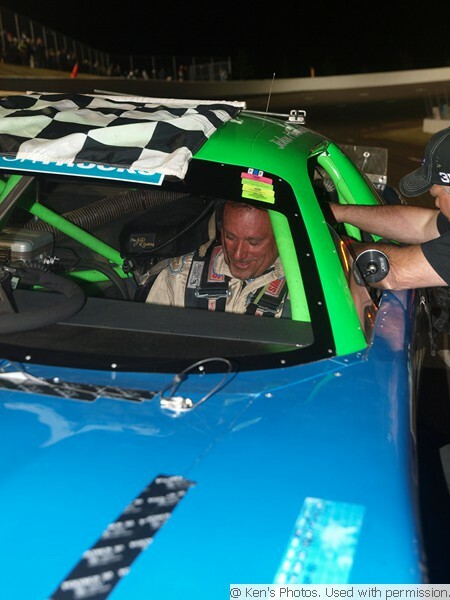 Flemming not only beat the best racers in the Maritimes to claim the win, but battled door-handle to door-handle and nose-to-tail with one of NASCAR’s best throughout much of the race, Joey Logano, to claim the win. Jonathan Hicken made a hard charge to the front of the field in the second half but settled for second after Flemming checked out in the last green flag run to the end. Logano, who finished third, was one of the first drivers in Victory Circle to congratulate Flemming. The thought of Flemming not winning another race, however, is distant with as good a car as he had in the IWK 250. He’s been searching for that little something extra in the car for several months and it looks like he found it. The win moved Flemming to the top of the series point standings with five races remaining this season as he gears up for an attempt to claim his fourth series title. Paid off it did: Flemming will collect the lion’s share of the $85k+ purse, claiming the $8,500 first-place prize plus $3,550 lap leader bonus plus $650 in contingencly bonus awards, bring an unofficial total to $12,700. Several top contenders were eliminated through attrition during the event including Donald Chisholm, who started from the pole after winning time trials; Chisholm and Logano battled fiercely for the lead in the first 100-laps before Chisholm made an unexpected pit stop which subsequently saw him get caught up in a wreck while advancing through traffic. 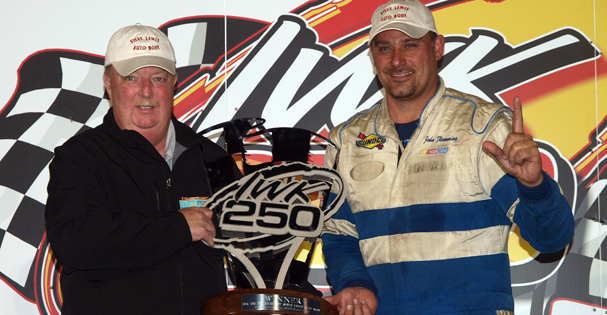 Mike Stevens and Shawn Tucker – both recent pro stock winners at Riverside – had made their way to the top five when a late race wreck eliminated their hopes of an IWK 250 win. 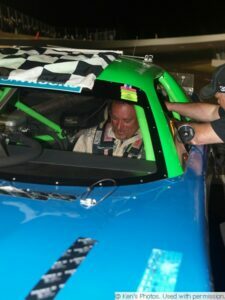 And two former IWK 250 winners, Darren MacKinnon and Wayne Smith, saw their hopes of becoming the events first repeat winner when Smith ended up in the concrete retaining wall after macKinnon made contact with him on lap 164, just after Smith had moved his familiar No. 44 into the top five; MacKinnon was several laps down at the time of the altercation. Southern short track superstar Corey Williams finished fourth in Rollie MacDonald’s No. 13 entry and Daryl Mahar rounded out the top five. Thirty-two cars were on hand; 28 started the race which saw 10 caution periods and was held in front of a capacity crowd estimated to be one of the largest, if not the largest, in track history. The facility can seat as many as 10,000 people and has space for approximately 800 campers; with the lots overflowing management had to start turning cars and campers away late Saturday afternoon. Pro stock heat races were won by Williams, Hicken, and Kent Vincent. Riverside International Speedway is back in action August 18 with round 10 of 12 for the Parts for Trucks Pro Stock Tour 2012 chase for the championship.